I am thrilled to have partnered with Princess Cruises to share our cruise through the British Isles with you. 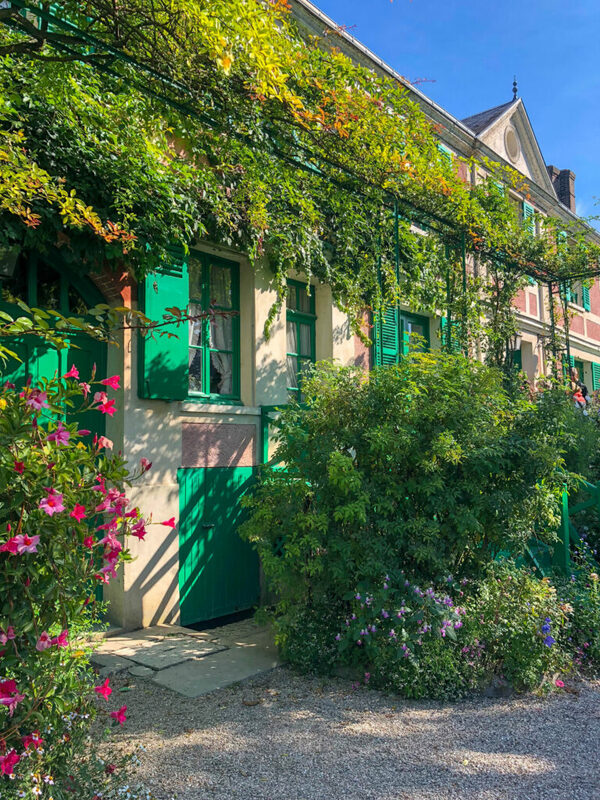 When visiting Giverny, France there is only one main street in town and it’s called Claude Monet street. 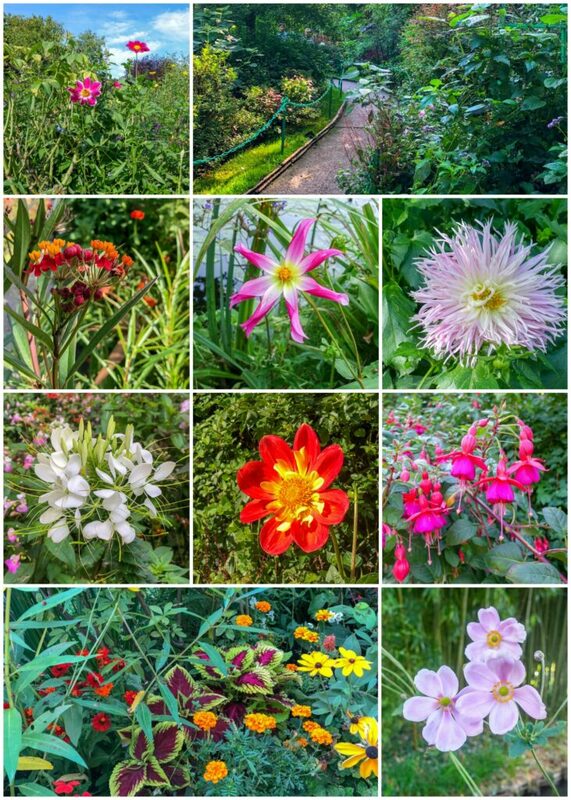 For many of us, Giverny is already synonymous with Monet’s garden. 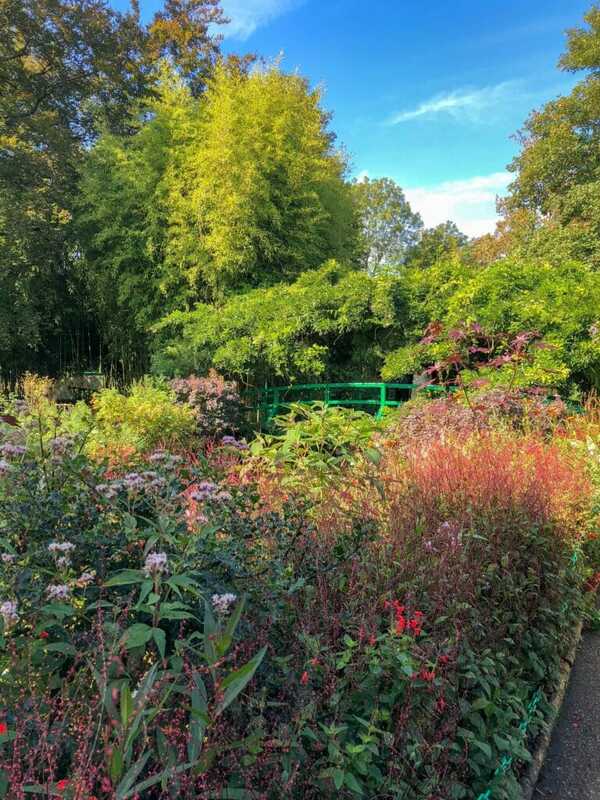 If we’re going to be really honest here, when we were first planning this trip, I initially was under the impression that Giverny was actually the name of Monet’s garden. So, yes, the two places are often spoken of and regarded as much the same. 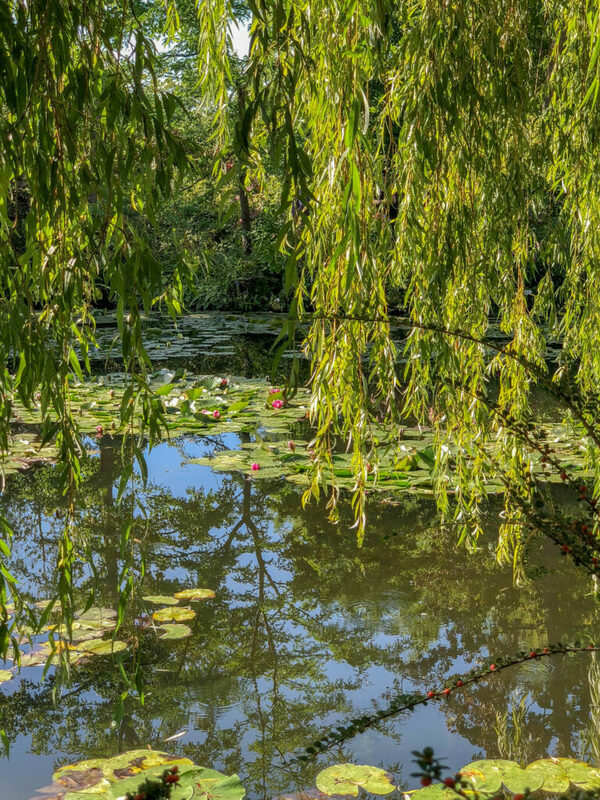 However, Giverny is actually the name of a small French village in Upper Normandy. 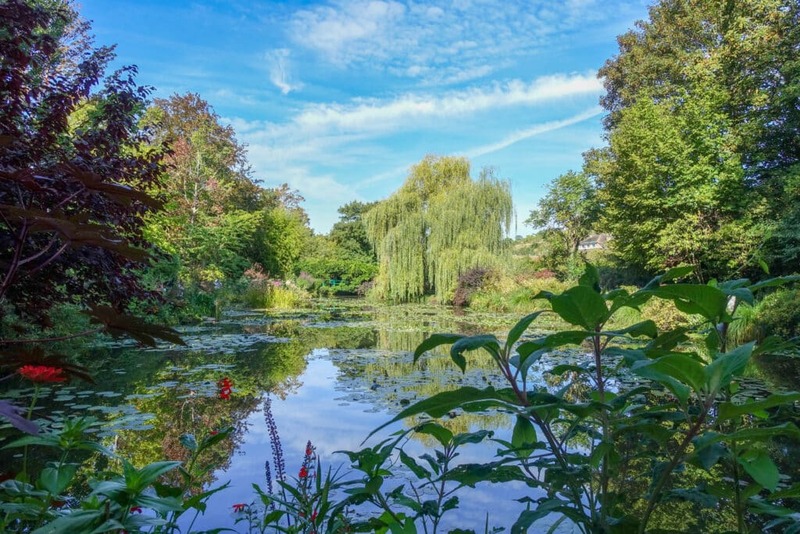 The village is just 2.5 miles across and this is where you will find Claude Monet’s home and garden. Early in his life, Monet struggled to be accepted as an artist and often struggled to just pay the rent. His desire to move around and find new places to paint was likely a factor in that. 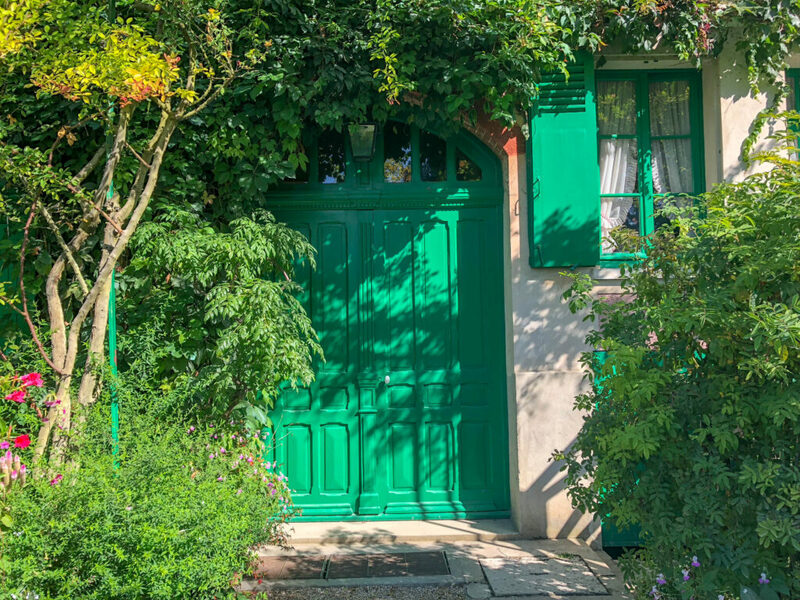 When he finally settled in Giverny, he was 43. His life and his work is very much divided into before and after Giverny. The inventions of the folding easel and paint in tubes enabled the artists of the time to break the rules and begin painting out of doors. Monet was not interested in the subject of the painting. He was interested in the light and he painted the light as he saw it. 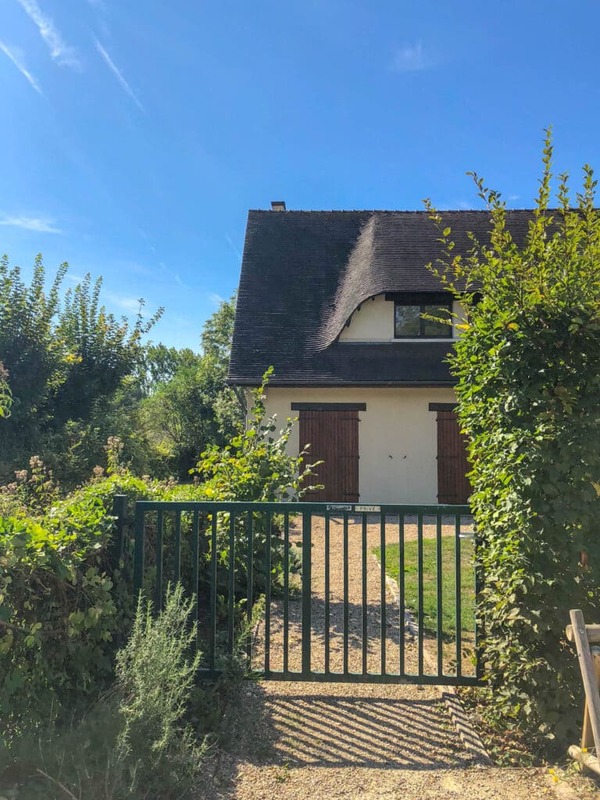 There are two parts in Monet’s garden: a flower garden called Clos Normand in front of the house and a Japanese inspired water garden on the other side of the road. 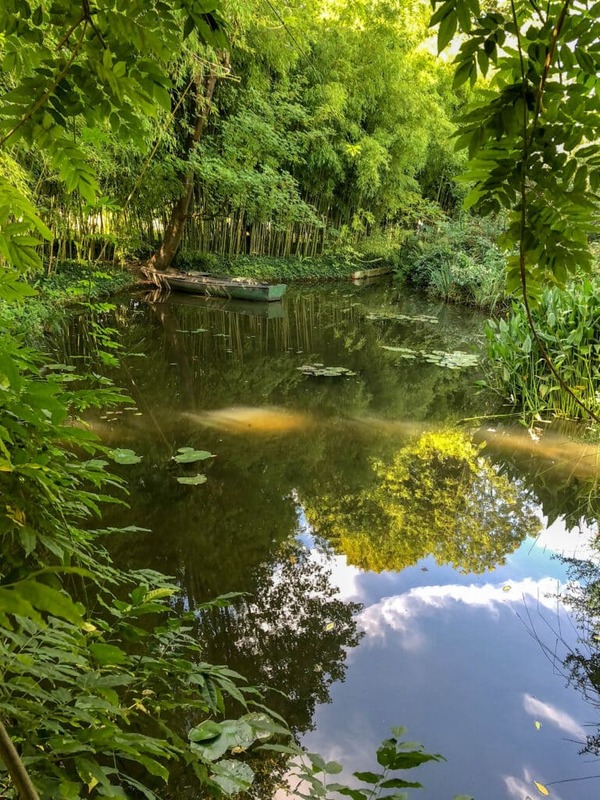 To get to the water garden, or the water lily pond as it is often referred to, you go through an underground passage (at the time of Monet it was necessary to cross the railway and the road). When first entering the water lily garden, the paths surrounding the water lily pond appear to be completely filled with people. However, I found that it was mostly tour groups. So, if you give the tour groups a moment to pass through, there are lovely spaces where you might not see anyone for a few minutes. I stood in awe many times as I looked out over the stunning water lily pond. The surface of the water lily pond reflects its surroundings like a mirror in the morning and it is clear as glass in the afternoon. You can see all the way to the bottom later in the day. Summer to early fall is the best time to see the water lilies. It’s dependent on the warmer weather just how early the lilies will arrive and how long they will last. We were fortunate to be there while the lilies were everywhere on the pond. I stood there long enough, as the morning was warming, that some of the flowers opened. It was truly a once in a lifetime experience to see in person the beauty that I’ve admired in Monet’s art for so long. 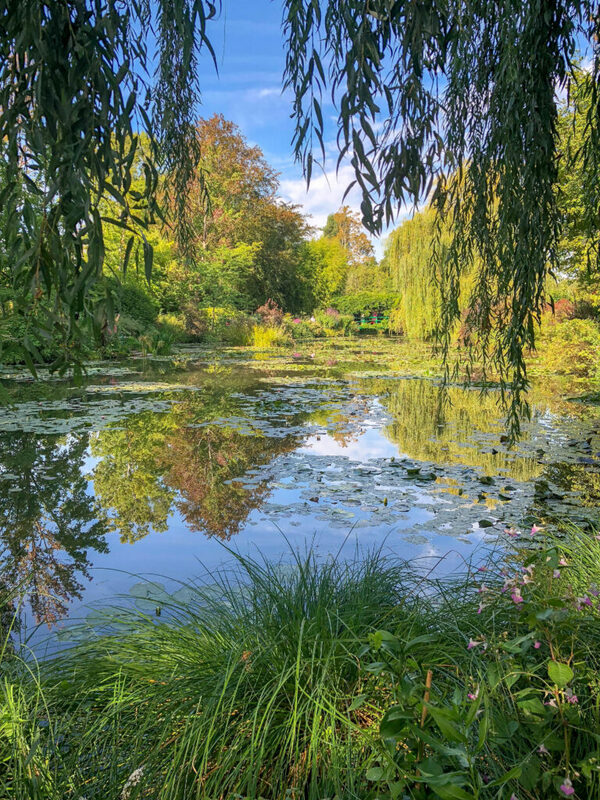 Monet imported the water lilies for his Giverny garden from Egypt and South America, something that scared the local authorities enough that they demanded he removed them. The people of the village were concerned that the plants would poison the area’s water. Monet ignored them and as a result, the garden became what it is today. It is said that Monet was obsessive about the gardens and controlled all of the work done in the garden. He had gardeners to help him, however, he made all creative and artistic decisions regarding the gardens. The gardeners simply helped carry out his desires. Every single morning, while Monet was alive, a gardener would get into the rowboat and go around the pond, meticulously cleaning water lilies that had collected soot from passing trains. The master insisted that, when he got out in his boat in the morning, the water lilies would be pristine. There are gardeners working in the garden today whose job is to remove every fallen leaf from the surface of the water every day. I don’t know if they still clean the surface of the water lilies themselves, but the ones we saw were pristine. 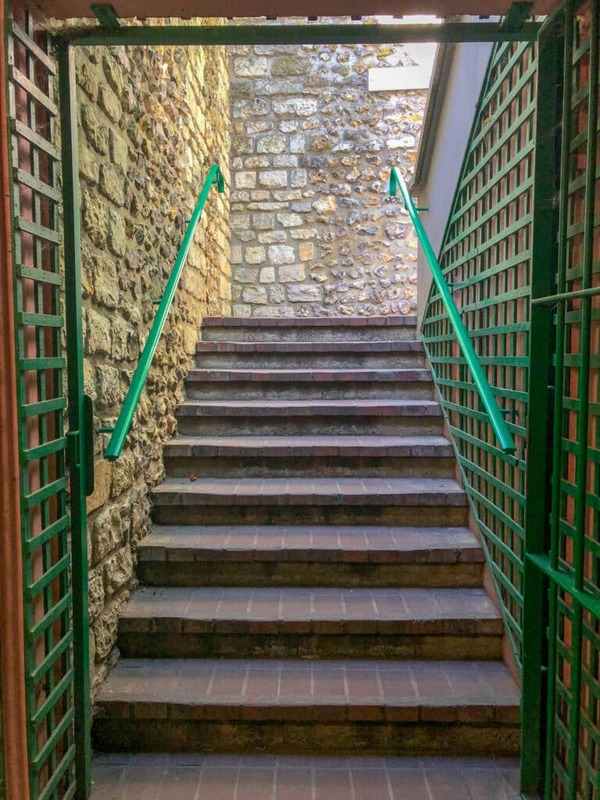 After walking down Claude Monet street and visiting his lovely home and gardens, give yourself a few minutes to step off of that tourist filled path. 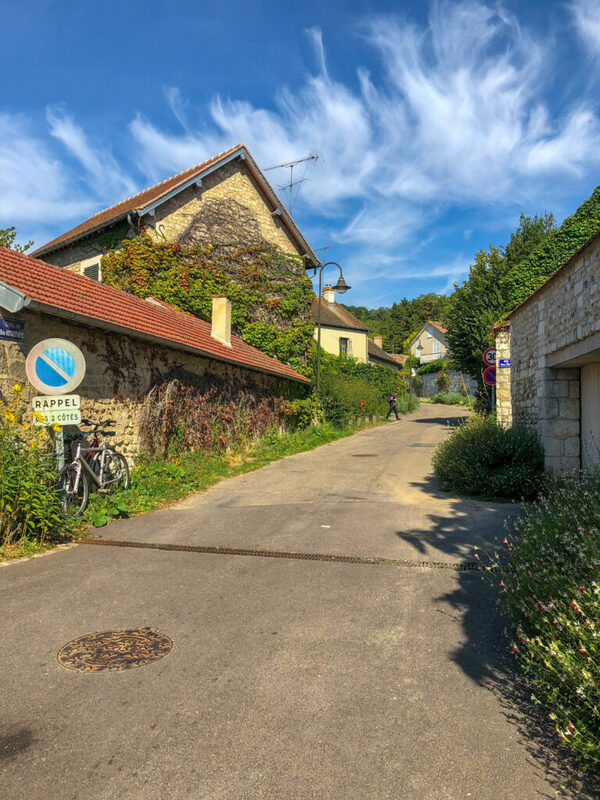 There are positively charming roads that wind up the hill towards other houses and we really enjoyed walking a bit in the village. 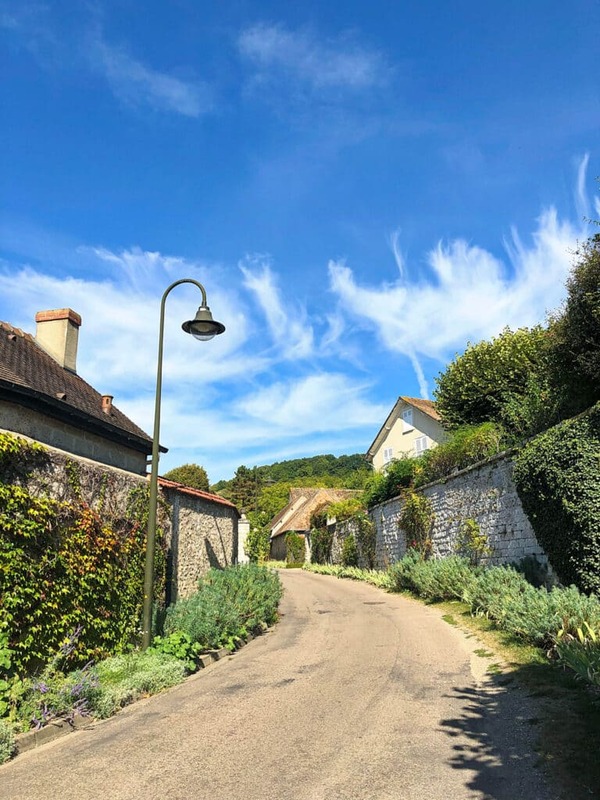 With a population of around 500, it takes some dedication to live in Giverny today. While the town is absolutely charming, it is also a very popular tourist destination seven months out of the year. As we walked along the streets away from the attractions, Sean and I wondered about the people who live their today. As beautiful as the area is, I’m not sure I would enjoy living where there are so many visitors in my streets almost every day. But for that location, maybe it would be worth it. 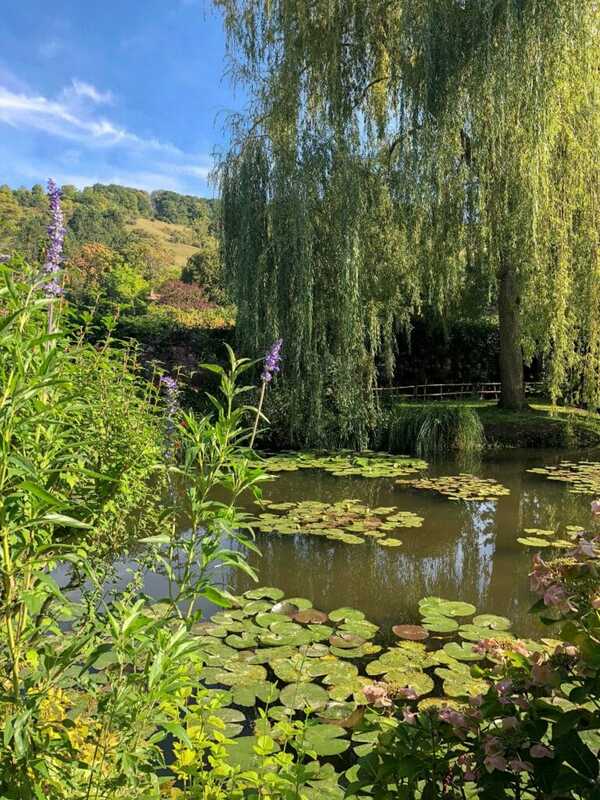 Giverny, France certainly is beautiful. To read more about our cruise through the British Isles, check out That Time I Turned 40. Twice. My 40ish Birthday, A Day at Dunrobin Castle, DIY Cheese Plates, A Day in Belfast, Ireland, and Irish Raisin Soda Bread.